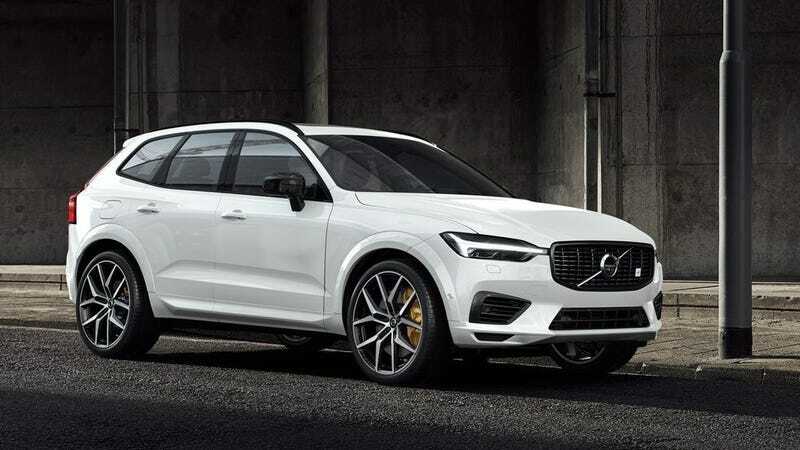 The new top-trim XC60 and V60 Polestar Engineered models get the twincharged (turbocharged and supercharged) four-cylinder gas engine combined with a battery back running down the middle of the car powering a rear-mounted electric motor. Volvo claims it’s good for 415 horsepower and 494 lb-ft of torque. But it’s a plug-in hybrid, so if you want the extra juice, you need to remember to fill it up and plug it in for the full effect. The two new models also get an Öhlins front strut bar, gold-painted six-piston brake calipers, bespoke lightweight forged wheels, a gloss black grille, extended wheel arches, and black chrome tailpipes. Some of that makes the car drive with more precision. Some of it just makes it look like it. Whatever, it all works. Inside, the models get gold seat belts, aluminum panels, a leather-wrapped sport steering wheel, and a charcoal color scheme. I was also told that the car really came alive closer to the limit, which I wasn’t exactly gunning for on the roads around Los Angeles at the time, so maybe there’s more to the car than I was able to eke out of it. (Eek out of it?) I came away much more smitten over the lower-trim R-Dynamic model, and I still feel that way. But I’m also not going to complain about more high-powered Volvos on the road, especially when there’s a wagon involved. Volvo hasn’t revealed production numbers or pricing for either the XC60 or V60 Polestar Engineered models yet, but it did announce they’ll be available this summer, so we’ll find out soon enough.